Sailing on the Norwegian Spirit from Venice, we’d left Izmir the day before and I woke up just before the 5:30 a.m. alarm in Istanbul. Our call to the theater was at 8:15 a.m. so I had plenty of time to eat my room service breakfast while sitting on our balcony. It was a lovely day and the views were fantastic. 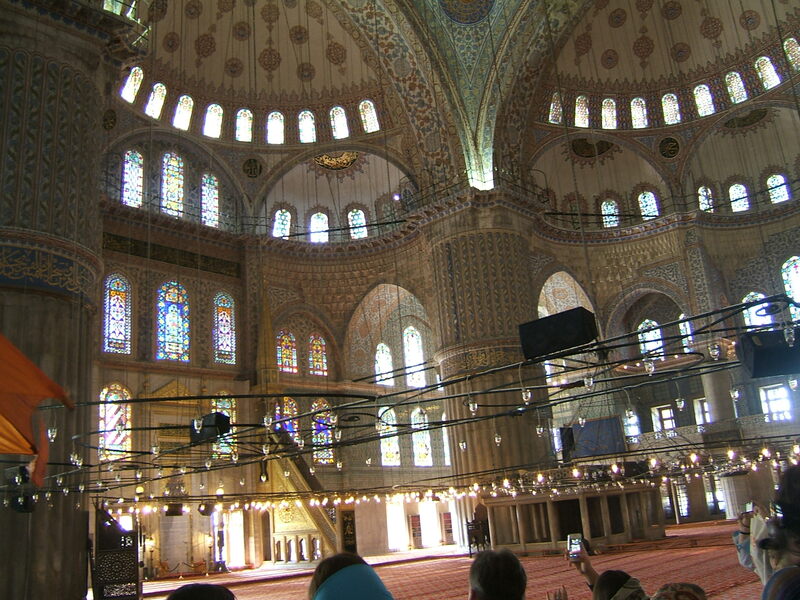 Our “Classical Istanbul” tour was with a group of 40. I had considered booking the small group tour instead, but I’m not sure it would have made any difference. Istanbul was crowded. Not just crowded. It was swamped. Clearly the most popular, there were 8 buses from our ship doing the “Classical Instanbul” tour, Tour bus schedules were switched around for each bus so that we never saw more than one other group at any of the sites we visited. It is a good plan to spread the cruise ship visitors around so that no one site gets too crowded with their own passengers. The problem we had though wasn’t that the Spirit had 8 busloads of tourists. The problem was that there were just so many tourists in general. The streets were flooded with people. Our tour began with a walk through the Hippodrome where horse and chariot races used to take place. The Egyptian obelisks were the most interesting feature of this public square. 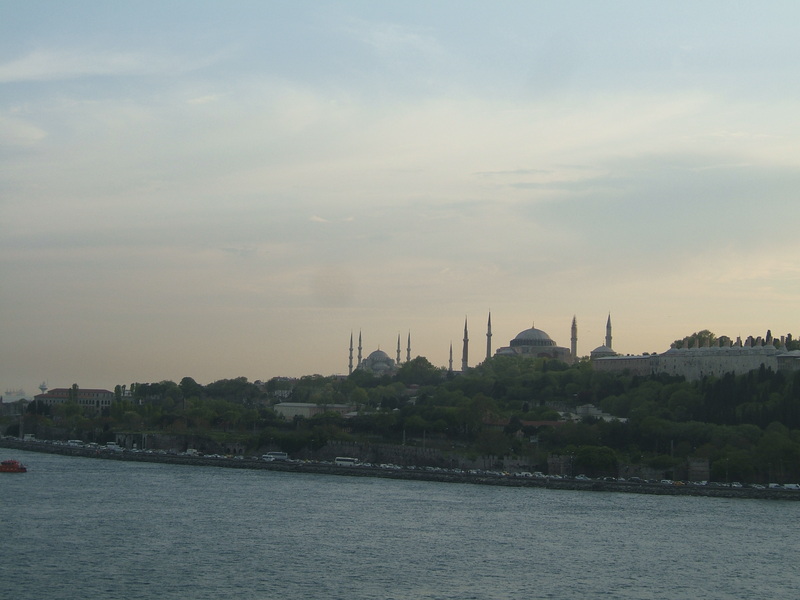 From there we walked to the Blue Mosque. There is no way to bypass the line and the line was long but it moved reasonably fast. You need to wear long pants, shirts with sleeves (short sleeves are okay) and women need to cover their hair. I had brought my own head scarf but the mosque provided them for women who didn’t. You take off your shoes and put them in the bag provided by the guide and then you can carry them with you until you leave. The mosque was beautiful and worth waiting in line to see. 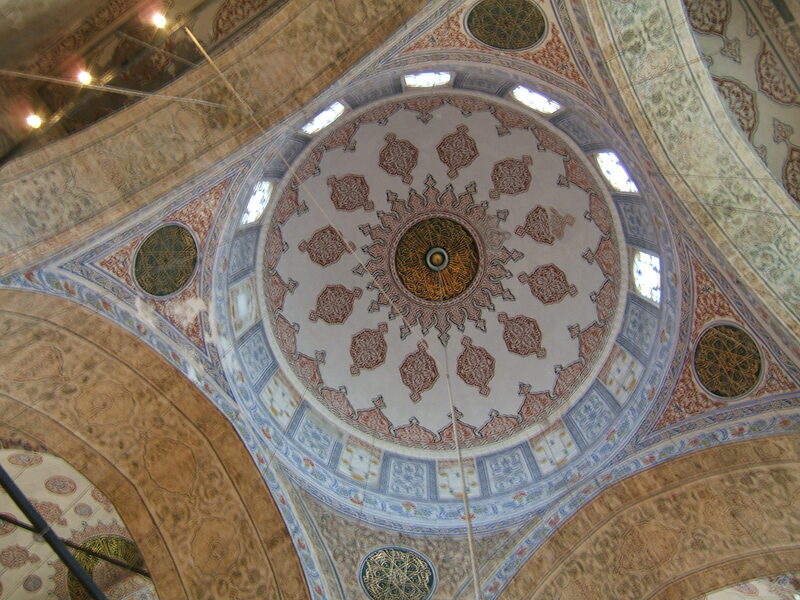 With its 21,000 blue tiles it was one of the most spectacular sights I’ve ever seen. Other people on the tour said they thought the Hagia Sophia was the highlight of the tour but the Blue Mosque was my favorite. Even though it was packed with people, there was something soothing and peaceful about the place. And nothing could compare with all those gorgeous tiles. 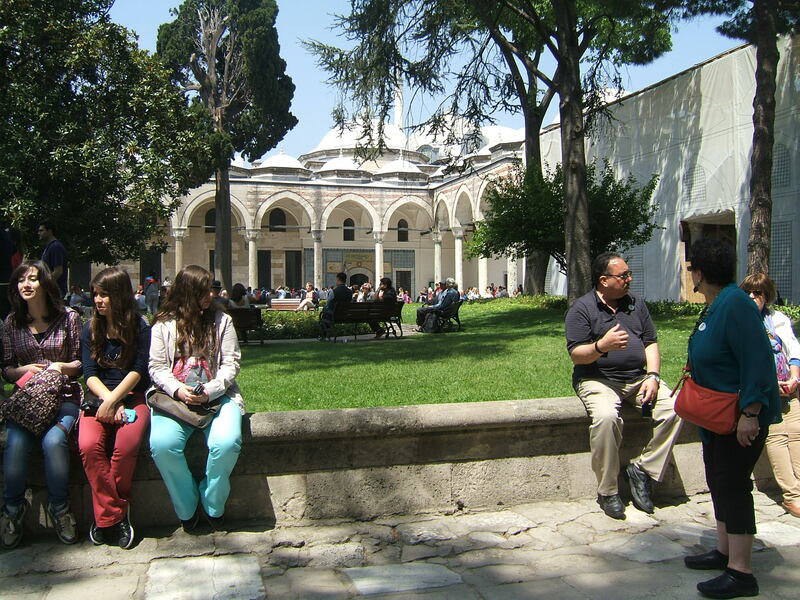 We next walked to the Topkapi Palace. This was the nightmare of the day. Even though we had pre-paid tickets and could bypass the ticket line, we still had to wait in the line at the entrance. For a long time the line didn’t seem to move and it was only because the crowd was so large. Everyone in our group got swept into the crowd of people – hundreds of people – pushing and shoving their way to the entrance. Keeping the group together was impossible. When we finally reached the door, everyone had to go through a body scanner and send bags through yet another scanner. There are only 4 body and 2 bag scanners. People were pushing from behind to get through. It wasn’t a safe situation. I’m not sure the scanners were for more than show since people were shoving bag after bag through the machine all at once and the workers were pushing people through the scanner very quickly. I can’t imagine anyone really had a chance to look at the scans or even pay attention if the scanner alarm sounded. It was impossible to keep an eye on your bag and you just had to guess when to place your bag on the scanner and then hope it would be there when you finally got through the body scanner and could retrieve it. Relieved to finally get inside, we found our group gathered off to the side and we talked about how we needed to change our schedule because we were now so far behind. The guide led us to the treasury which is four connected rooms. The line to get into the first room was very long but if you were willing to bypass the first room you could get into a still long, but not as long line to enter the second room which would allow you to see rooms 2-4. We got into the shorter line and followed the crowd through the treasury. Items are placed in cases around the outside of the room so all we had to do was follow the single line of people moving from one case to the next. Everything on display was beautiful but I am not much into museum displays so this wasn’t going to be a hit with me under any conditions. I’d have much rather walked through palace rooms to see where and how people had actually lived. We regathered with the group outside without seeing any more of the palace which, for me, was a huge disappointment. We could have skipped this stop entirely and I’d have not felt like we’d missed anything. But, no matter. We were on our way to the next stop and hopefully the day would improve. At about 1 p.m. which was probably a 1/2 hour to an hour late, we went to lunch. Lunch was a great sampling of Turkish foods. It was very good and more food than any of us could begin to eat. The appetizer plate alone was enough to fill me up and that was followed by a salad, main course and dessert plate. We sat at large round tables with 8 or 10 people at each one. After our hectic morning, it was nice just to have a chance to sit down! From lunch we went to the Grand Bazaar arriving at 2 p.m. We were given an hour and 15 minutes to go off on our own since the guide had already said we wouldn’t be doing the obligatory rug demo as we’d all done it the day before. The endless maze of streets in the bazaar was fascinating as were the tiny little shops packed solid with merchandise. We immediately were struck woth sensory overload! I would have been interested in buying a few souvenirs but didn’t buy anything at all. I had been looking to buy some scarves and Doc would have liked a t-shirt or two and we both would have been interested in glassware. Each time we stopped to look at something though, the salesmen were constantly in our faces, insisting on showing us what they thought we should like and giving us no chance to just look around on our own. A couple of rug salesmen tried to drag us into their shops. After our rug experience in Izmir however, there was no way we were going near a rug shop! The bazaar was a great place to see but most of the shops sold many of the same things and it was crowded and hot inside. We did not wander too far from the main entrance for fear of getting lost. We would walk down a side “street” but always circle back up the next to the main street again before taking off down another. We were able to see many shops that way but without getting too far from the main drag. We would have gotten hopelessly lost otherwise because all of the streets look alike. Even though we didn’t buy anything here, just wandering and taking it all in was a great experience. It was late in the afternoon when we arrived at the Hagia Sophia and the crowds had thinned out so, while it was still crowded, it wasn’t as bad as the earlier sites and our visit was enjoyable. This is a masterpiece of Byzantine architecture and is now a museum. We got into a conversation with our guide about the current government and how there has been talk of turning the Hagia Sophia, now a museum, back into a mosque. She said many of the people were angry about the current government’s push to move Turkey away from secularism and to move it back toward its religious roots which the people were arguing was a step backwards. She had much to say about the current conditions in Turkey and the many reasons people were feeling disgruntled. A week after we got back home, protests broke out in Istanbul. 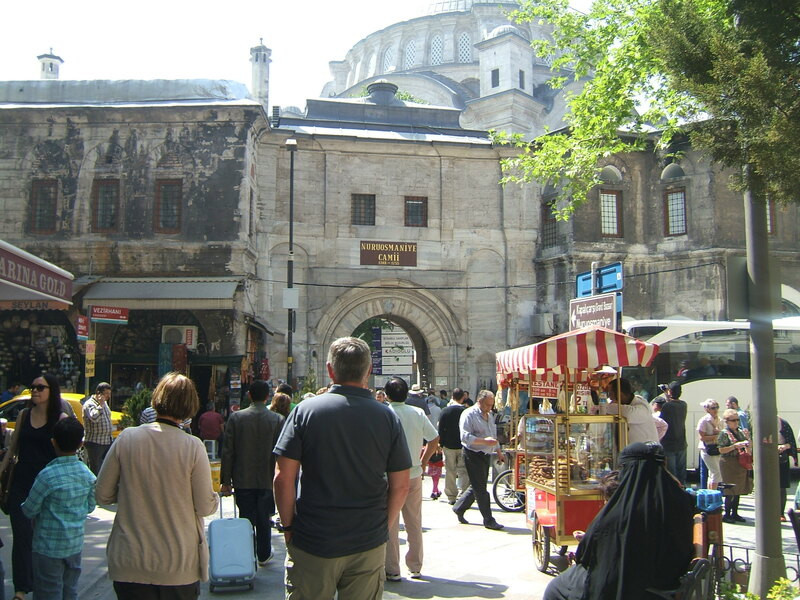 Istanbul is such a remarkable city and it was disappointing that the crowds made sightseeing difficult even though it was only April and not the height of the tourist season. If I were to ever go back, I would choose to go in the winter. The sights would be just as spectacular and the crowds would be less. Returning to the ship late – a half hour past the all aboard time – we were happy to be with a ship’s tour which meant the ship waited for us. As soon as we boarded they pulled up the gangplank and we were on our way. 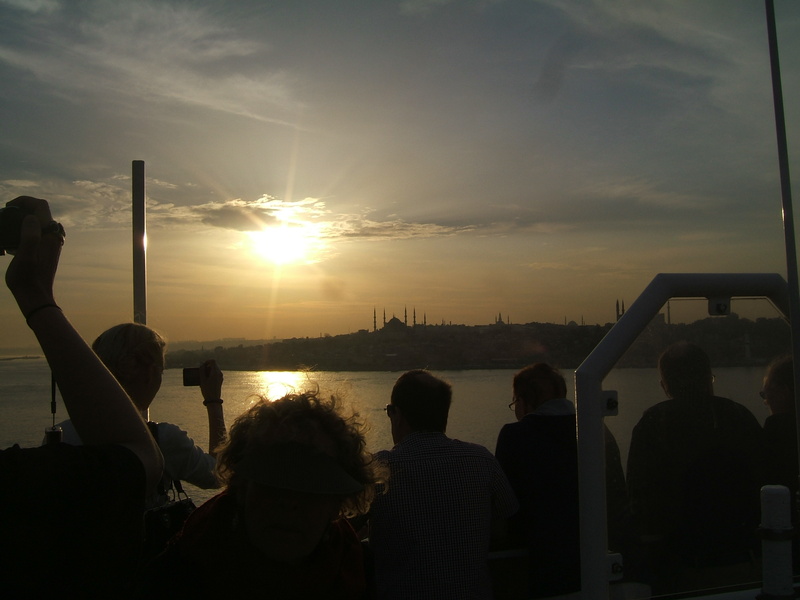 The views from deck as we left the city, with the setting sun and minarets silhouetted against the orange sky, were amazing. Next stop… Mykonos.